Let your hiring managers know that all 3rd party submissions will now be going through RecruitiFi and they should direct any solicitors to you, or your career page, so they can apply to be part of your Community. Working through the RecruitiFi platform is going to allow you to streamline how candidates are submitted, how feedback is given, and how to handle soliciting agencies when they call or email. Letting your Hiring Managers know that they should expect candidates to be shared through system emails is an important part of getting your hiring team aligned with this new process. Candidates will be sent via email to them when you 'Share Candidates'. Hiring managers can reply directly to you via email, saving you time and effort. 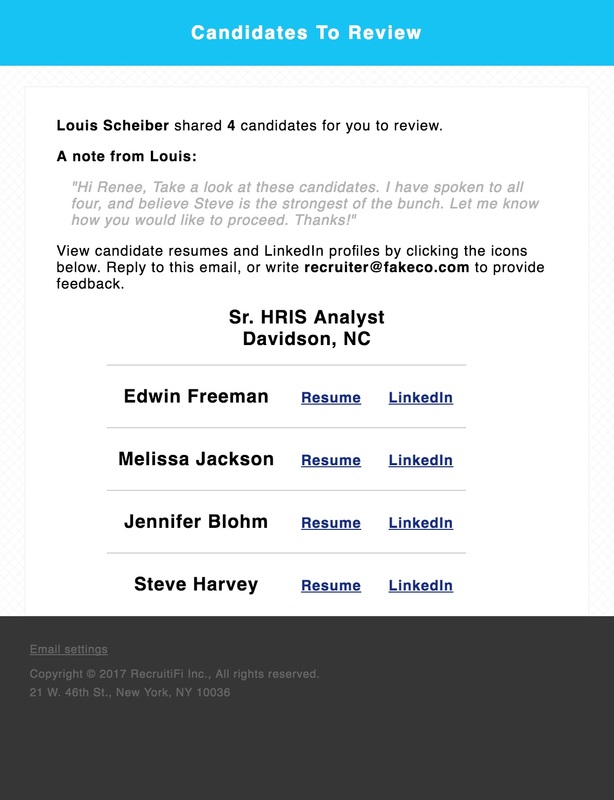 RecruitiFi provides two (2) solicitation management tools. One is in-app, and the other is a link to apply to the RecruitiFi Community on your career page. You can invite Legacy Agencies to work at any predetermined fee. For this you will need their full contact details and the fee you wish to add them at. Choose the 'Legacy Invitations' tab.